When it comes to Christmas food it’s the roasts that take centre stage, whether it’s a classic butter-basted Turkey; a honey-glazed Ham; or an alternative joint such as Lamb, Duck or Beef. So if there’s one Flint & Flame Knife Set that is a huge part of Christmas, it’s the Flint & Flame 2 Piece Carving Set. Available in a stunning wooden presentation box, or our standard gift box, this beautiful set makes the perfect Christmas gift, or simply a timely addition to your own collection. This stunning 2 piece set includes the Flint & Flame 9″ Carving Knife and the Flint & Flame Carving Fork and will ensure that when it comes to carving your Christmas roast, you’ll be ready to handle it like a pro! The key to effortless carving is a stable joint of meat that allows the knife to do it’s work without excess movement. With it’s very long tines, and ergonomic handle, this fork will help you get a secure hold on even the largest of roasts making carving a pleasure. 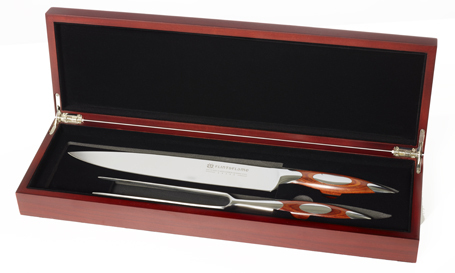 Click here to view this Carving Set in our online shop.